"Smitty the mechanic who helped me. Not only let me know the things that needed to be fixed but also prioritized them for me. He explained everything to me with patience and understanding. I will go here every time I need a great mechanic". Leona Stout.. "Great shop if you live in LS! They are fair with the estimate, if you say you need it back by a certain time they do everything they can to make that happen. Very friendly staff there and they have coffee and a waiting room with cable TV. Great guys. Won't go any place else now!" Tom H.. "They always fix it right fast and cheap". Gary Z.. "These guys are the best around. I've used them several times, and their customer service is top notch. They've always contacted me the same day with an estimate before any work was done, and they are very fair and honest. The final bill has never been different than the estimate, never any surprises. I would recommend these guys for any car repairs, both domestic and imports". Tom W.. "Service was good as usual. Everything went well and no problems or wait". Kevin A.. "Very helpful and friendly. Simply fixed what needed fixing and did not try to sell us on other items that needed repair. GREAT SERIVE AND TURN AROUND TIME!" Warren H.. "We have always been happy with the service we receive if we were unhappy we would not return the hasslers"
"How do I thank wonderful caring people, excellent customer service and above all the repair on our vehicle! This company goes above and beyond providing repairs. My Marine son was stranded in Lee Summit. He was picking a vehicle to go Texas. The vehicle started but did not move. We called several garages the repair would take two days. The mechanic at Herrington was called. They towed the vehicle, worked on it until late in the night so they knew what the problem was. Ordered the part and fixed it the next day. They are fast and know exactly what to do. Herrington let him borrow a car to get to the hotel. The mechanic fine turned the vehicle did an oil change and he was on the road. The mechanic called to make sure everything was running along the way. Thank you for opening your door and putting your arms around my son. Of all the special ways that gratitude can be expressed, the simple phase “God bless you” is the best". "I took my car here because I was having ignition issues & problems with my radiator thermostat burning up my engine coolant. They replaced the cap to the coolant reservoir & the thermostat & less than 3 months later I have white smoke coming out of my hood again & my coolant was all gone. Herrington just offered to diagnose the vehicle for free but would not cover anything else. I don't recommend wasting your time & money here!" Overall Excellent. "Very honest business. I bought a car from them and the transmission went out on it. They rebuilt the transmission with no cost to me. They stand by the cars they sell. Very happy with them". "I was very happy with my experience"
"Work on foreign and domestic cars for reasonable price. 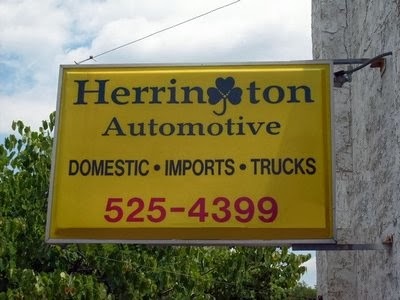 Herrington Auto has services our foreign and domestic cars. We've had everything done from transmission repair to brakes to safety inspections. These guys are usually fast and answer the phone when you call! !They are centrally located in Lee's Summit. Once in a while we wait longer then we want to for our car, but they have also saved us alot of money.It is hard to find a garage to trust these days. Herrington has always treated us fairly.I would recommend you give them a try". "one of the few honest people left!.. You can trust your auto work to Herrington Auto. They did my brakes and ignition switch. They do a great job and have integrity in keeping their good name. I have not bought a car yet from Pat, but you can be sure that he tells you exactly what the cars condition is. Really fair and honest. You can trust Pat Herrington to be honest and up front with you. That is everything!" "My brakes were really bad and I took my car to Herrington Auto for the repairs. They did an excellent job fixing my brakes, even saving me money for a used part that I needed for the wheel. The price was definitely fair and they fixed my car within 2 hours. While waiting they allowed me to use a loaner car so I was able to take care of other business. The mechanic was really great. He showed me everything he did for the repairs. I recommend Herrington Auto for your repairs because they were upfront and honest with me about all I needed to have done. Great honest folks. I know its a cliche but - they really are a hometown repair place that you can trust to do your work. I'm satisfied!"